We are proud to partner with the following organisations. PECB is a certification body for persons, organizations, and products. It provides training, examination, audit and certification focused on ISO Standards. 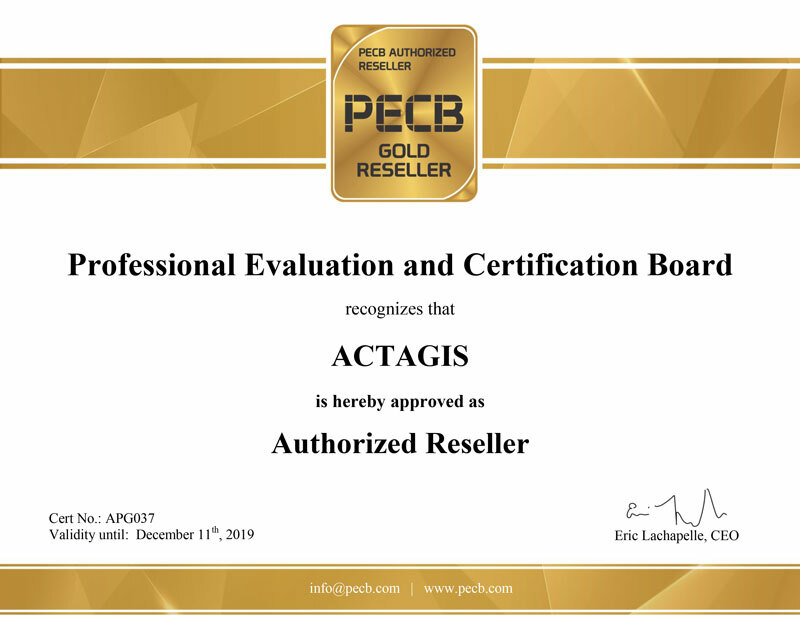 ACTAGIS, as the official PECB partner and trainer, proposes in Switzerland and Europe, learning and preparation classes for all PECB certifications. The Business Continuity Institute (BCI) is the world’s leading institute for business continuity. Established in 1994, the BCI has established itself as the leading membership and certifying organisation for Business Continuity (BC) professionals worldwide. ACTAGIS, as the official partner of the BCI for Europe and Asia, proposes learning and preparation classes for BCI certifications and provides the exams sessions. As an independent, nonprofit, global association, ISACA engages in the development, adoption and use of globally accepted, industry-leading knowledge and practices for information systems. ACTAGIS, as the official and exclusive partner of the ISACA Swiss Chapter in the French part of Switzerland, proposes learning and preparation classes for all ISACA certifications (also worldwide for in-house training). The Clusis is the Swiss association dedicated to the security of information systems. It is a non-profit association founded in 1989. It has more than 300 members. It has become a recognized pole of competence in the field of information systems security. ACTAGIS, as the official sponsor of CLUSIS, participates actively to the “Cyber Security” initiatives in Switzerland.